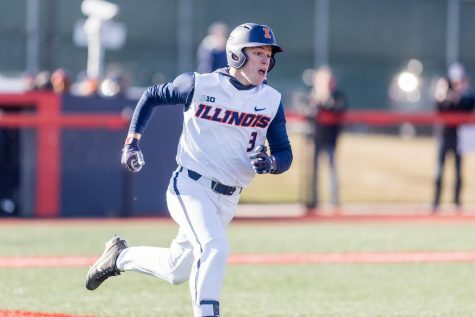 Illinois catcher Jeff Korte (32) hits an RBI single to right giving the Illini the lead in the game against Rutgers at Illinois Field on Friday, April 13, 2018. 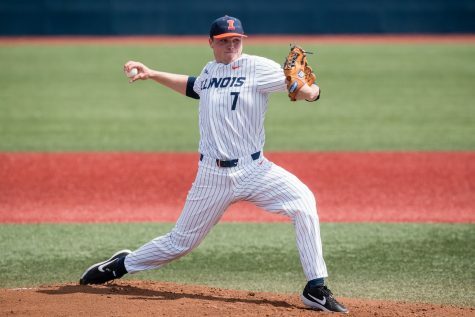 Rutger’s promising start against Illinois on Sunday was short lived. 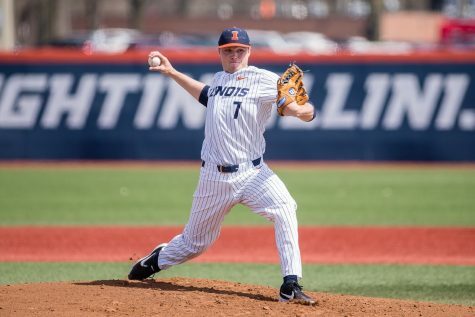 The Scarlet Knights opened, scoring with a first-inning double, but quickly fell to the Illini’s bats. 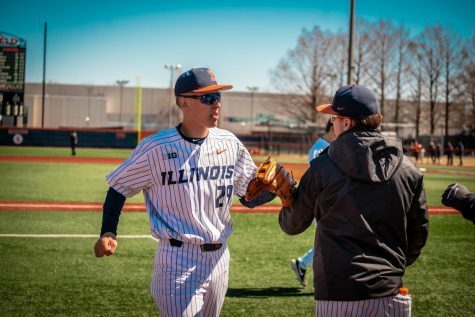 In the third inning, sophomore Michael Massey hit a grand slam just over the center field wall to break the game open and give Illinois a 4-1 lead the team would not surrender. 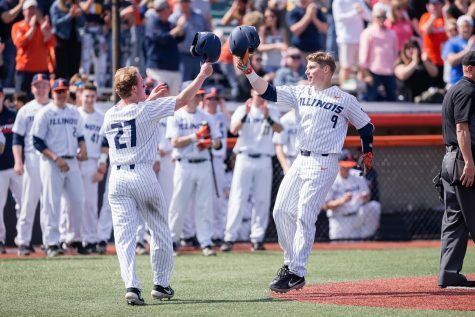 The Illini would go on to win 10-4, after winning the series’ previous contests in tighter 13-12 and 2-1 affairs. Junior third baseman Grant Van Scoy led off with a ground-rule double, then sophomore Ben Troike laid down a bunt that dribbled down the third base line but stayed fair to get on base and move Van Scoy to third. 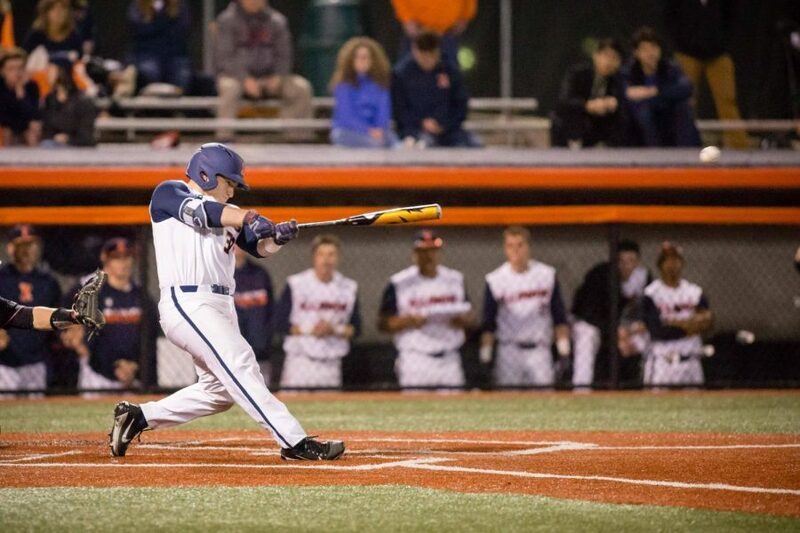 After Massey’s slam, sophomore Jack Yalowitz hit a two-run homer and the Illini still had no one out. 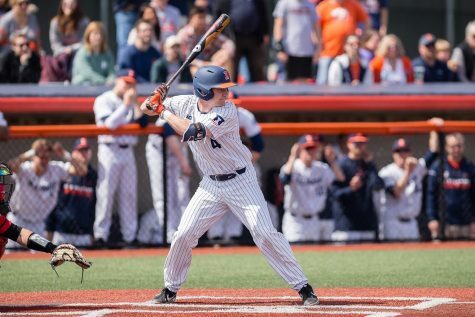 Rutgers came back with a three-run shot from Kyle Walker to make it 7-4 in the fourth, but Illini sophomore Ty Weber kept the Scarlet Knights at bay. 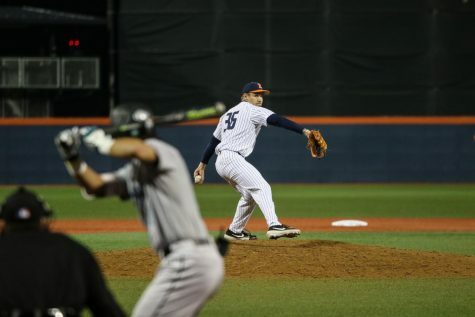 He pitched a complete game and struck out six of the 34 batters he faced. The Menomonee Falls, Wisconsin, native gave up only four hits and walked one batter to get his fourth win of the season. Later in the game, Van Scoy doubled again. He scored after junior center fielder Zac Taylor tripled to left center field. Troike followed it up with an RBI of his own, driving in Taylor with a single to center. The win was head coach Dan Hartleb’s 400th career victory. 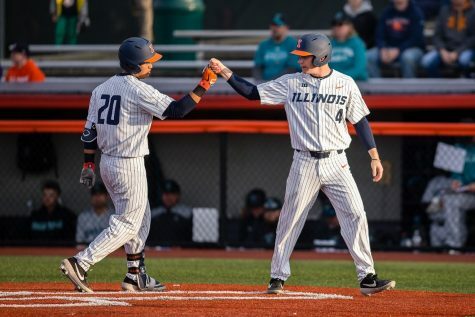 In his 13 seasons at the helm of the program, Illinois reached it’s first-ever NCAA Super Regional in 2015, won two Big Ten titles in 2011 and 2015, and has made three NCAA Tournament appearances in 2011, 2013 and 2015. Hartleb credited the quality of players he’s had in his time at the University, as well as the numerous assistant coaches, trainers and others who have impacted the program. 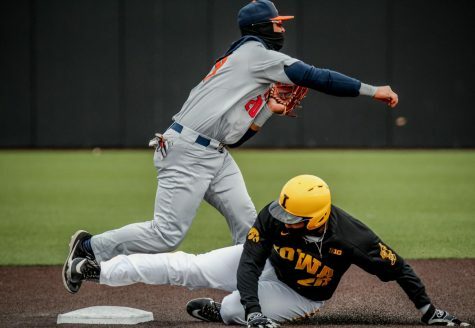 The victory helps secure the third place spot in the Big Ten for Illinois, which is currently trailing Michigan (7-0) — winners of 16 games in a row — and Minnesota (7-1). For Hartleb, every opportunity to get a sweep is crucial to convert in order to be an elite team. He said that sometimes, winning the first two games of a series can ruin a team’s mindset. Illinois did not let their prior victories interfere though. 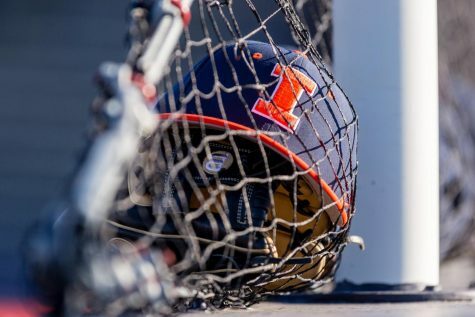 The Illini have now won five games in a row and are 23-8 overall and 9-3 in the Big Ten. The team is set to take on Valparaiso (11-19, 2-4 Missouri Valley Conference) in the fifth game of its nine-game homestand on Tuesday at 6 p.m.